GST fusion protein with sequence ELANRAEVPLSWSVS SKLNQHAELETEEEEKNPEELTERNG, corresponding to residues 374-414 of mouse Kir3.2 (GIRK2) (Accession P48542), Intracellular, C-terminal part. (MW: 31 kDa. is the size of the fusion protein). Homology Rat - 40/41, human – 37/41 amino acid residues identical. Preadsorption Control 3 µg peptide per 1 µg antibody. 1,2. Guinea pig Anti-GIRK2 (Kir3.2) Antibody (#AGP-013), (1:400). 3,4. Guinea pig Anti-GIRK2 (Kir3.2) Antibody, preincubated with the control antigen. Anti-Guinea pig IgG (Sigma #A7289 or Jackson ImmunoResearch #106-035-006). Immunohistochemical staining of mouse substantia nigra pars compacta (SNC) using Guinea pig Anti-GIRK2 (Kir3.2) Antibody (#AGP-013), (1:400). 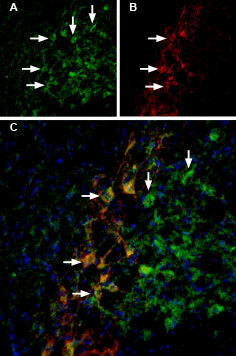 A. GIRK2 staining (green) appears in soma (horizontal arrows) and dendrites of dopaminergic neurons (vertical arrow). B. Nuclei staining using DAPI as the counterstain (blue). C. Merged image of panels A and B.
Immunohistochemical staining of rat substantia nigra pars compacta (SNC) using Guinea pig Anti-GIRK2 (Kir3.2) Antibody (#AGP-013), (1:400). 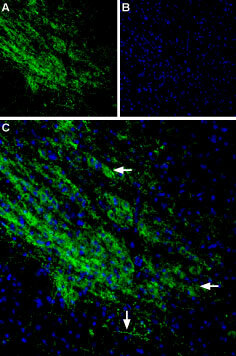 A. GIRK2 staining (green) appears in soma (horizontal arrows) and dendrites of dopaminergic neurons (vertical arrow). B. Nuclei staining using DAPI as the counterstain (blue). C. Merged image of panels A and B.
Hibino, H. et al. (2010) Physiol. Rev. 90, 291. Inward rectifying K+ (Kir) channels generate under physiological conditions, large K+ conductance at potentials negative to Ek but permit less current flow at potentials positive to Ek. Kir3.2 (also known as GIRK2 or KCNJ6) belongs to a G-protein gated subfamily of Kir channels. Kir3.2 is one of four subunits (Kir3.1, Kir3.3 and Kir3.4) that form functional tetrameric KG channel assemblies. KG channels are activated by GTP (GTPi) in the presence of an agonist or by intracellular GTPγS in the absence of an agonist. There are at least four different isoforms of Kir3.2 which are generated by alternative splicing from a single gene. Kir3.2 isoforms exhibit differential expression patterns in various tissues such as brain, pituitary, pancreas, and testis, where they usually coincide with the expression of other Kir3.x subunits. Kir3.2 is expressed on the cell surface due to two forward trafficking signal in its cytoplasmic region. One is an ER export signal in its NH2 terminus and the other is a post-ER trafficking signal that is composed of a cluster of acidic residues in the COOH terminus. Knockout of Kir3.2 is accompanied by a decrease in Kir3.1 protein expression in the brain, the development of spontaneous seizures, and a range of phenotypes related to sporadic seizures1. Double staining of GIRK2 channels in substantia nigra pars compacta using Tertiapin-Q-ATTO-488 and Guinea pig Anti-GIRK2 (Kir3.2) Antibody. Rat brain sections were first incubated with 33 nM Tertiapin-Q-ATTO-488 (#STT-170-AG), (green). The same sections were incubated with Guinea pig Anti-GIRK2 (Kir3.2) Antibody (#AGP-013). A. Tertiapin-Q-ATTO-488 binding appears in profiles of substantia nigra pars compacta (SNC) neurons (arrows). 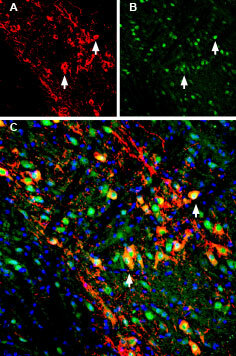 B. GIRK2 staining (red) is detected in profiles of SNC neurons (arrows). C. Merge of the two images demonstrates co-staining of GIRK2 channels by Tertiapin-Q-ATTO-488 and by Guinea pig Anti-GIRK2 (Kir3.2) Antibody. DAPI staining (blue) is used to stain nuclei. Guinea pig Anti-GIRK2 (Kir3.2) Antibody (#AGP-013) raised in guinea pigs is a highly specific antibody directed against an epitope of the mouse protein. The antibody can be used in western blot and immunohistochemistry applications. It has been designed to recognize GIRK2 from mouse, rat, and human samples. The antigen used to immunize guinea pigs is the same as Anti-GIRK2 (Kir3.2) Antibody (#APC-006) raised in rabbit. Our line of guinea pig antibodies enables more flexibility with our products such as immuno-colocalization studies, immunoprecipitation, etc.